There is apparently much concern and confusion regarding the transfer of the KVR lands to the Penticton Indian Reserve. My original blog posting on the topic attracted many hits and some comments. In addition, there have been a few exchanges (not always cordial) in the local newspapers. What follows is a summary of my current understanding of the situation. As always, your questions and comments are welcome. Update 17 Oct 2010: I have added a much shorter and cleaner summary here. Update 28 May 2010: The PIB is hosting an information session on June 2nd at 7 PM in the West Bench Elementary School gymnasiium. See here for additional information. Update 07 Apr 2010: The RDOS is holding a "town hall meeting" on the KVR issue on Tuesday, April 13th, at 7 PM in the West Bench Elementary School gymnasium. This will be an RDOS view. Representatives from INAC and the Federal Government WILL NOT be in attendance. However, if you have any questions that seem more appropriate for INAC, the Federal Government, the Provincial Government, or the PIB, please email (mbrydon@rdos.bc.ca) or call (250-809-2563) me with a heads-up as soon as possible. I may be able to forward the question to the right people and get an answer for you prior to the meeting. Update 23 Mar 2010: I have asked INAC to check this document for errors and omissions so that it can provide the basis for a newsletter to residents (no use sending out a newsletter full of incorrect information). I am adding information as I get it. Update 17 Apr 2010: The Penticton Herald published a map from 1897 showing the boundaries of IR#1 prior to the turn of the century. Click on the image to get a larger version. The line along the western edge of Okanagan Lake is presumably a road or trail. 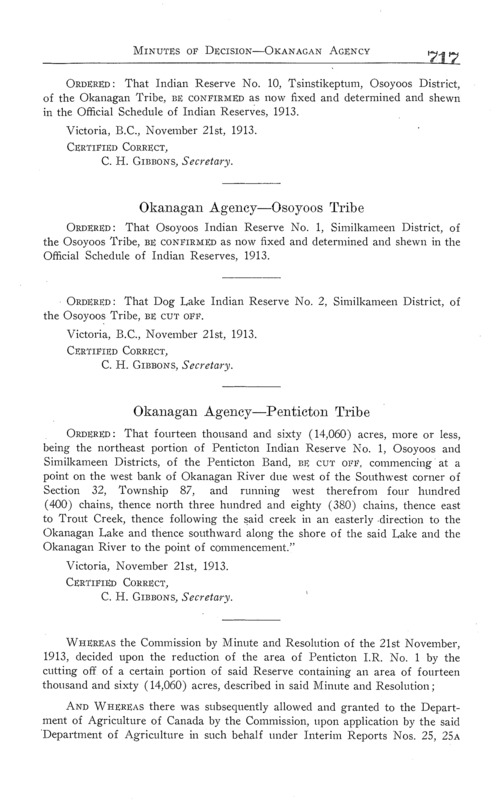 In Canada, an Indian Reserve is “a tract of land, the legal title to which is vested in Her Majesty, that has been set apart by Her Majesty for the use and benefit of a band.” Thus, although Indian Reserves in Canada are technically Crown Land, the property is held in trust for the band. We generally use the simple term “band land” to describe this convoluted arrangement. Also note that the Indian reserve system in British Columbia is undergoing modernization. Some bands in BC have recently moved towards fee simple ownership of their lands (see this MacLean’s article). The Kettle Valley Railroad, which was completed in 1915, acquired land through IR#1 for its Summerland-Penticton leg and also for its branch line to Okanagan Falls, which was completed in 1931. The strips of land now in question are those remnants of rail bed through (what are now) Sage Mesa, the West Bench, along the Penticton River Channel, and along the west side of Skaha Lake (see map). The KVR was subsequently bought by the Canadian Pacific Railroad (CPR), which operated the line until some point in the early 1980s. The tracks were eventually ripped up and the rail bed land was transferred to CPR's real estate division, Marathon Realty, where it still remains. Penticton Council voted 4-2 Monday to write a letter to Indian and Northern Affairs Canada stating that it is the city’s position that the roughly 139 acres of land, six parcels in all, should be maintained in its current ownership by the citizens of Canada. The land is not owned by the citizens (or government) of Canada. It is owned by Marathon Realty—a situation that has been ruled "illegal" by the courts (see below). As an aside, I recall trains running along this line when I was younger and I can think of nothing worse in a residential area. Of course, these trains were tiny—one or two boxcars—and, in retrospect, it seems probable the CPR was only running them to satisfy some type of “continuous use” condition for ownership of the land (see below). The land which is now the West Bench was cut-off from IR#1 for potential veterans’ housing in 1918 but was not developed as such until 1952 (see MacDonald, p. 130). It appears that the remnants of this cut-off not used under the terms of the Veteran’s Land Act (VLA) passed into private ownership and eventually became the Sage Mesa, Husula Highlands, and Westwood Properties subdivisions. Thus, the two cut-offs from IR#1—the KVR and then the West Bench—were distinct in purpose and legal justification. Update 29 Mar 2010: The cut-off from IR#1 that enabled the development of the West Bench et al. actually occured in 1912-16 as a result of the federal/provincial McKenna-McBride Agreement. This agreement was disputed by bands across the province and, in 1982, the Province of BC settled with the PIB for $14M and 12,000 acres of land (see news story in the Spokane paper—the only news story I could find; see the full terms of the 1982 Settlement Agreement). Since the KVR cut-off is separate from the McKenna-McBride cut-off, it was not covered in the 1982 settlement. In other words, regardless of how the KVR acquired the right-of-way, the land must be returned to the Crown since the land is no longer being used as a railroad. The 1985 court decision against the CPR was upheld on appeal. Critically, this decision does not mean that the former KVR lands must necessarily revert to IR#1. As I understand it, reserve status can only be granted through an Order in Council—more or less an executive decision by the federal cabinet. Update 23 Mar 2010: Apparently (according to INAC), the court decision does mean that the land must revert to IR#1—it is stated explicitly in one of the CPR agreements. Moreover, return to IR#1 appears to be the whole rationale behind the court's directive to the CPR to return the land. This is a significant new piece of information. (6.5) Existing encumbrances must be specifically identified and mechanisms for dealing with them must be determined in conjunction with the Department of Justice prior to the proposed acquisition by INAC. Update 24 Mar 2010: What this means is that the Indian Act has mechanisms (apparently Sections 28.2 and 35) that are similar to what the CPR used to run its railroad. That is, the right to use the property is granted to (say) the water purveyor or electrical utility as long as the utilities are in the ground. INAC has been pretty clear on this: They will not (and would never consider) moving forward with this unless access rights are established for core infrastructure, access to private property, and so on. 35. (1) Where by an Act of Parliament or a provincial legislature Her Majesty in right of a province, a municipal or local authority or a corporation is empowered to take or to use lands or any interest therein without the consent of the owner, the power may, with the consent of the Governor in Council and subject to any terms that may be prescribed by the Governor in Council, be exercised in relation to lands in a reserve or any interest therein. (12.1) In recognition that First Nation communities and non-First Nation communities live side by side, the federal government promotes a “good neighbour” approach. This involves First Nations and municipalities sitting down together to discuss issues of mutual interest and/or concern. Where requested by a municipality or a First Nation, there is a requirement to negotiate arrangements in such areas as joint land use planning/by-law harmonization, tax considerations, service provision and future dispute resolution. (12.2) The potential requirement to negotiate in these areas means that both parties must engage in discussions based on good will, good faith and reasonableness. Note that the need for discussion may be with respect to ATR proposals within the boundaries of a municipality (where consultation/negotiations leading to an agreement may be necessary) or with adjacent/abutting municipalities (where consultations alone may be necessary). (12.3) While municipalities must be consulted in accordance with this policy, they have no general or unilateral veto with respect to reserve proposals. Indian and Northern Affairs Canada (INAC) is currently working through its ATR checklist in order to prepare a recommendation to the federal Cabinet (e.g., notifications have been sent to local governments, utilities, and so on—copies of the letters to the RDOS and West Bench Irrigation District have been posted here). It is understood that, barring any unforeseen complications, INAC will recommend that the KVR lands be reattached to IR#1. As a member of Cabinet, Mr. Day will likely have some input into this decision. The role of the RDOS in all this is tricky. Although local governments have no standing in the federal matters of land ownership or reserve status, the RDOS does have a parks mandate. And most of the people I have talked to want the land set aside as a linear park and formally incorporated into the Trans Canada Trail. However, I find it very hard to argue against the spirit of the 1985 court ruling. The land was legally part of IR#1, it was removed for “the public convenience” to support the development of the railroad, and now, according to courts, it must be restored to the Crown (with the understanding that the federal government then has the option of restoring the land to IR#1). Update 23 Mar 2010: Again, according to INAC, the court decision gives the Government of Canada no discretion in this regard—the lands must be reattached to IR#1 and cannot simply be held by the Crown. Will an RDOS objection have any impact on the final decision of the federal cabinet to reattach the KVR lands to IR#1? This is a tough one and clearly requires some careful thought. If the granting of reserve status is successfully blocked, then the KVR lands remain in the hand of the Crown and (we may assume) will be available for development as part of the Trans Canada Trail for the use and enjoyment of all. If, on the other hand, the RDOS attempts to block the granting of reserve status and fails, then it may become difficult for the RDOS to negotiate on this and other issues with the PIB. After all, the PIB has expressed clear interest in reacquiring this land. Property rights are a matter of law in this country, not a matter of public opinion. Imagine if I put together a petition of a few thousand signatures that your property should be dedicated a park (for the public good, of course). You might be outraged and would inevitably rely on the rule of law to protect your property rights. The issues are much the same in this case, except that band lands in Canada lack clear property rights. Instead, it is up to the Government of Canada, through reserve status and other measures, to simulate something like property rights for its native citizens. My guess is that the Government of Canada will not be persuaded that reserve status should be withheld in order to facilitate a linear park—the principles at stake are too important for that. On the other hand, the federal government may conclude that the shape of this particular land and its location (partially within non-native residential areas) makes it of little practical use to the PIB. The symbolic benefits to the PIB of returning the land to IR#1 would be more than offset by many practical and jurisdictional problems created by the reattachment. Perhaps comparable symbolic benefits could be achieved in other ways. Update 24 Mar 2010: It is now clear that any RDOS objection will have no impact whatsoever on the narrow issue of transfer of the KVR lands to the PIB. This has been decided by the courts. We are currently investigating the possiblity of some kind of land swap. This almost certainly would require significant participation by the Province. In my view, the RDOS should be taking every possible opportunity to work with the PIB to develop a better relationship. I believe that any efforts by the RDOS to obstruct the ATR process by going through INAC would be detrimental to our relationship with the band. Reattachment of the KVR lands to IR#1 does not preclude development of the land as part of the Trans Canada Trail. Indeed, as noted above, the land is of little practical use to the PIB as anything other than a park. If the RDOS can work with the PIB to turn the KVR into part of the Trans Canada Trail, then everyone wins. Section 12.1 in the ATR (quoted above) opens the door for a wide range of negotiations regarding use of the land, bylaw harmonization, and even the funding mechanisms for development of the linear park (anyone who has spent time on these trails recognizes that some investments in maintenance are long overdue). My assessment of the issue at this point is that is that the best way to move forward (that is, the way with the greatest chance of success) is to enter negotiations with the PIB within terms of the ATR policy—especially the bits about good will, good faith and reasonableness. Confrontation and paternalism have not worked in the past; why would they work now? Why does the KVR have so many pot holes? It appears from the information that it is not up to the residents of West Bench and Sage Mesa to decide what happens to this land. It sounds like, by rights, this land will revert back to PIB control. So, as residents, what can or should we do? Put bluntly, I'd say: Get over it, and move on to more useful deliberations: figure out how to peaceably work out an agreement with the PIB regarding public land access and use for the time when they will most likely get back ownership of the land. Because Chief Kruger has determined that he would like to see the land revert back to the PIB, it is up to us to work with him. This is the only way that we are going to see positive results for everyone involved. We shouldn't only forge positive relationships because it serves us best to do so. This is also about recognizing what is right. Getting the KVR land out of limbo may actually be a positive step, not only for the PIB, but for residents of WB/Sage Mesa as well. It's my understanding that the RDOS and the PIB have an agreement in place for PIB lands along the Channel Parkway walkway. The RDOS contributes to trail maintenance, and it is open for everyone to use. We could think proactively, and look to putting a similar model in place for the KVR lands. The response from the RDOS to the Letter of Inquiry would have some impact on the proposed transfer of lands to the PIB. It turned out both assumptions were incorrect (more on this below). As such, this page is meant to be a more coherent summary of the situation (as it has slowly emerged from INAC, hence all the updates). Also, I have tried on this page to provide residents of Area F with some indication of how I plan to move forward on this. Some Area F residents agree with this direction; some disagree. I am not certain, given what I have learned in the last month, that I see a realistic alternative. I am certainly open to specific suggestion about how the RDOS might proceed. As for the Letter of Inquiry, some background is helpful here: INAC met with the City of Penticton in September, 2009, to brief them on the ATR process and the specific legal and historical background of this case. Unfortunately, for whatever reason, no one from Penticton passed this along to the RDOS. So although we knew something was afoot with the KVR (let's face it, this has been dragging on for a very long time) we were caught off guard by the Letter of Inquiry, which I did not see until early February, 2010. After several long discussions with the INAC representative in Vancouver, we now understand that the Letter of Inquiry was a mere formality. There is nothing the RDOS can do to prevent the transfer—it is based on a legal agreement between the CPR and the PIB and subsequent court interpretations of that agreement. I hope this is abundantly clear by now. Moreover, the absolutely critical conditions the RDOS might insist on, such as protection for rights-of-way, roads, crossings, infrastructure, and so on, are already clearly addressed in the federal Additions to Reserve Policy (see above). Had we been properly briefed by INAC last year, we would have known all this and saved much wringing of hands and gnashing of teeth. Also, we now understand that INAC expected us to take the lead on getting the word out to residents. As such, we are working to put the information on this page into a more readable form and sending it out to residents as a newsletter. The only remaining piece of the ATR policy that forsees any meaningful role for local governments is clause 12.1 (see above) about negotiating "arrangements in such areas as joint land use planning/by-law harmonization, tax considerations, service provision and future dispute resolution". These are the issues the RDOS will be negotiating with the PIB in the coming months. I understand Alan. However please recognize two things. First, the RDOS has tried to get information on this long-running affair out to residents as quickly and accurately as possible. I sent copies of the Letter of Inquiry from INAC to members of the Area F Parks Commission, Advisory Planning Commission, and anyone else I thought might be interested on the evening of the 4 Feb, 2010, RDOS meeting (the meeting in which I first saw the letter). I asked these residents, who are by definition active members of the community, to circulate the news as widely as possible and send me their comments. I posted the INAC letter to this site the same evening and made an explicit request for feedback. I received some feedback and, as it turns out, the KVR page on this site has received several hundred hits (that is, more people have viewed the information on this site than have attended public open houses). All feedback, letters from residents, and petitions were forwarded to INAC with the RDOS response. The RDOS sent out a newsletter and held an open house on the KVR/ATR process in April, which is soon as I felt we had sufficient information on the issue to be in a position to talk about it. Prior to sending out the newsletter, we had its contents checked by INAC in Vancouver to ensure we were not adding to the confusion. Second, as noted above, the Government of Canada regards this transfer as a legal obligation dating from a 1985 court decision and, as such, not much debate is going to occur (at least around the issue of the transfer itself). I realize that people feel they are not being heard. But at the same time, we must be realistic about our standing in this matter. The PIB and the CPR had a deal that pre-dates any of us and now the terms of that deal are playing out with or without the blessings of West Bench and Sage Mesa residents. Let's face it: we all know (or should know) that our residences border PIB lands. In the same way that the City of Penticton has every right to decide that it wants to charge West Bench residents more to use its pool and community theatre, the PIB should be expected to look after its own interests. I am surprised that people are suprised by this. The task that remains for the RDOS is to use this an an opportunity to work with the PIB. We want to ensure that both communities have the same vision for the lands along the west side of the valley. We have learned a thing or two in the last 60 years on the West Bench about what works and what does not and we want to share our experiences with the PIB. For example, we are slowly coming to the expensive realization that septic fields on small, silty lots are not a great idea. Both our communities could benefit by working together with the City of Penticton to provide sewer. Indeed, sewer is unlikely to happen without cooperation. It is on issues like this where debate and consultation with residents will be critical. We are just not there yet.